<af:activeCommandToolbarButton> The activeCommandToolbarButton creates a button in a toolbar. It is normally used inside of a <af:toolbar> component. activeCommandToolbarButtons are not rendered on printable pages. <af:activeImage> The activeImage component renders an image specified by the source property and supports changing this property through active data. <af:activeOutputText> The activeOutputText component supports styled text and changing of this text through active data. The text can optionally be left unescaped. Unlike OutputText, conversion to and from Java objects is not supported. <af:breadCrumbs> A breadCrumbs component is used in hierarchical site layouts to indicate the path back to the root page of the hierarchy with links. <af:button> The button component creates a button that can be set to either generate an action or navigate to a destination. The button can be used on a toolbar or placed elsewhere on the page. 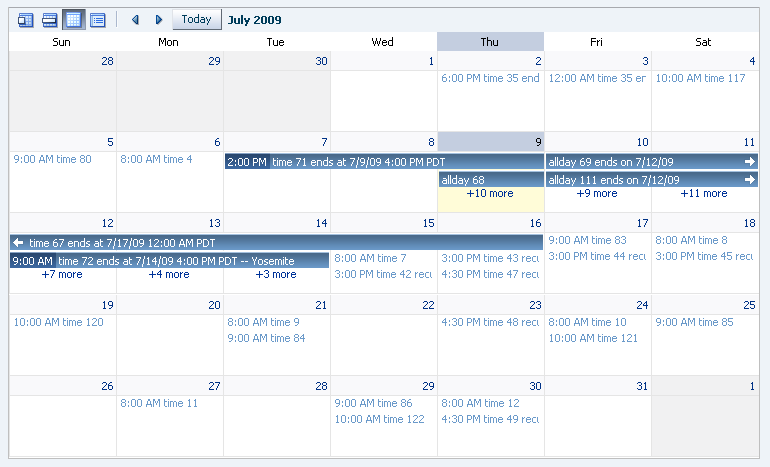 <af:calendar> The calendar component provides the ability to view activities in a calendar. <af:carousel> The carousel component displays a spinning series of items based on rows of a collection model. <af:carouselItem> The carousel item component defines what each item in the carousel looks like. <af:chooseColor> The chooseColor component is used in conjunction with an inputColor to allow the user to quickly select a color value without having to navigate to a secondary window. <af:chooseDate> The chooseDate component is used in conjunction with an inputDate to allow the user to quickly select a date value without having to navigate to a secondary window. <af:codeEditor> The codeEditor component creates an input widget for code editing. It also supports displaying a label and messages. <af:commandButton> The commandButton component creates a button that, when pressed, will generate an action event on the server. The button can contain text, an image, or text and an image. <af:commandImageLink> The commandImageLink component creates a link that has icon support, and when pressed will generate an action event on the server. <af:commandLink> The commandLink component creates a link that, when pressed, will generate an action event on the server. <af:commandMenuItem> The commandMenuItem component creates a menu item representation that, when pressed, will generate an action event on the server. 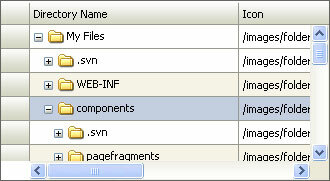 <af:commandNavigationItem> The commandNavigationItem control creates a a navigation item representation of a UIXCommand. The item could be rendered as a link, an option, a button, etc. 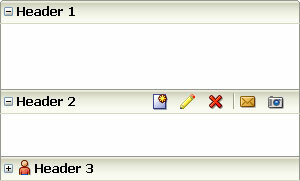 <af:commandToolbarButton> The commandToolbarButton creates a button in a toolbar. 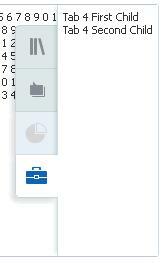 It is normally used inside of a toolbar component. <af:contextInfo> The contextInfo control adds an area which can be clicked to show contextual information. No image. <af:deck> The deck component is a container that shows one child component at a time. When changing which child is displayed, the transistion can be animated. <af:decorativeBox> The decorativeBox component stretches the child in the center facet to fill all of the available space. It is bordered by eight styled areas. The top bordered area may contain stretched content from the top facet such as navigationPane tabs. <af:dialog> The dialog control is a layout element that displays its children inside a dialog window and delivers DialogEvents when the OK and Cancel actions are activated. <af:goButton> The goButton creates a push button that navigates directly to another location instead of delivering an action. <af:goImageLink> The goImageLink tag is an HTML link with an icon support. <af:goLink> The goLink tag is an HTML link. <af:goMenuItem> The goMenuItem component creates a menu item representation that navigates directly to another location instead of delivering an action. <af:gridCell> The gridCell control is a layout element that serves as a cell of a gridRow component. <af:gridRow> The gridRow control is a layout element that arranges gridCell children for a parent panelGridLayout component. <af:image> The image control creates an image tag. <af:inlineFrame> The inlineFrame component is used to create an Inline Frame tag. <af:inputColor> Renders an input field for colors. The field can be tied to a ChooseColor element for easy color picking. <af:inputComboboxListOfValues> Used for selecting and returning data for fields in the main page. <af:inputDate> Renders an input field for dates. The field can be tied to a ChooseDate element for easy date picking. <af:inputFile> The inputFile component is a component that can be used to upload a file. It supports displaying a label, text, and messages. <af:inputNumberSlider> Represents an input slider component with a single value. <af:inputNumberSpinbox> Creates a browser input widget; it is used to enter numbers and it has a spinbox to quickly increment or decrement the number. <af:inputRangeSlider> Represents an input slider component with dual values. <af:inputText> An input text field control. <af:link> The link component creates a link that can be set to either generate an action or navigate to a destination. The link can be used on a toolbar or placed elsewhere on the page. <af:listItem> Component that is used as a child of the listView component. 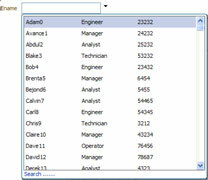 It can also be placed inside the "groupHeader" facet to provide grouping support inside the listView . 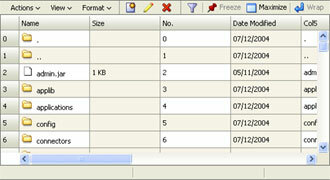 <af:listView> The ListView is used to display list data. It also supports selection (both single and multiple), and grouping of data. <af:masonryLayout> The masonry layout component is a container that shows its children in a grid like a dashboard. <af:media> The media component displays media content, such as audio, video, or image in a player embedded in the user agent. 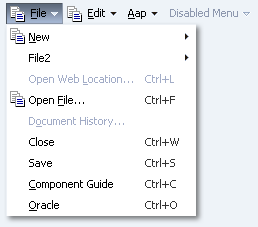 <af:menu> Represents a vertical menu component. Typically, this is used as a child of a menuBar or popup. <af:menuBar> Represents a MenuBar component. 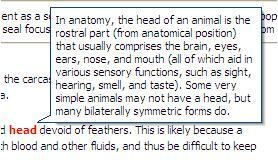 Its children are menu components. <af:message> Component that displays a message on behalf of a component. ADF input components typically support automatically showing their own messages, so this tag should be used only when setting the "simple" attribute to true. <af:messages> The messages tag displays important page-level messaging information to the user. <af:navigationPane> The navigationPane component creates a series of navigation items representing one level in a navigation hierarchy. <af:noteWindow> A note window is a floating panel that contains read-only information associated with a particular UI component. <af:outputFormatted> The outputFormatted bean accepts a string in its "value" attribute containing a very limited set of HTML markup and outputs formatted results. <af:outputLabel> Component that displays a label for a form component. <af:outputText> The outputText component supports styled text. <af:pageTemplate> Page Templates provide a re-usable page definition that allows the application developer to provide consistent branding, and page layout across the application. <af:panelAccordion> The panelAccordion control creates, contains, and shows a series of items defined by showDetailItem nodes. <af:panelBorderLayout> The panelBorderLayout component is a layout element which lays out all of its children consecutively in its middle. <af:panelCollection> A panel component that aggregates collection components like table, treeTable and tree to display standard/application menus, toolbars and statusbar items. <af:panelDashboard> The panelDashboard component arranges children into a grid of columns and rows. It will attempt to stretch its children to fill up the width of a column and the specified row height. 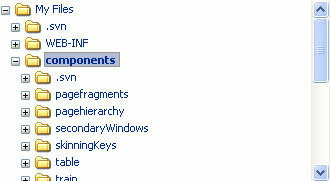 <af:panelDrawer> The panelDrawer control contains a series of items defined by showDetailItem nodes. The drawer can be "opened" by clicking one of the item "handles". <af:panelFormLayout> The Form Panel lays out input form controls, such that their labels and fields line up vertically. <af:panelGridLayout> The panelGridLayout component is a layout container component that uses one or more gridRow components to describe the rows of a grid layout structure. Each gridRow uses one or more gridCell components to describe the cells for columns in that row of the grid layout structure. <af:panelGroupLayout> A panel component that displays its children in a group. 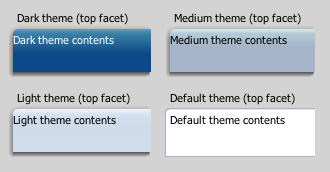 <af:panelHeader> The Header Panel control places a label and optional icon at the top of a section. <af:panelLabelAndMessage> This component lays out a label and children. <af:panelList> The panelList control outputs each visible child in a list with a bullet next to it. <af:panelSplitter> Use this to divide a region into two parts with a repositionable divider. <af:panelSpringboard> The panelSpringboard control shows a series of items defined by showDetailItem nodes in a strip of icons with the showDetailItem details or as a grid of icons with the details hidden. <af:panelStretchLayout> The panelStretchLayout component stretches the child in the center facet to fill all of the available space. <af:panelTabbed> The panelTabbed control creates, contains and shows a series of items defined by showDetailItem nodes. 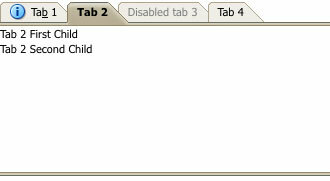 <af:panelWindow> A panel component that displays its children in a window. <af:popup> The popup component is an invisible control whose contents will be used in popup windows, such as context menus. <af:progressIndicator> The progressIndicator component can be used to give users an understanding that there is a back end task in progress. 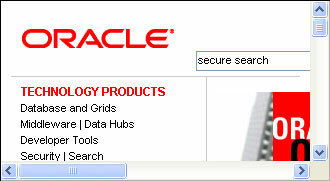 <af:query> The Query control is used to display a complete search panel. <af:quickQuery> QuickQuery component is used to do a quick search. <af:region> The region tag allows dynamic content to be included in a master page. <af:resetButton> The reset button control creates a push button which will reset the content of a form for all input and select components. 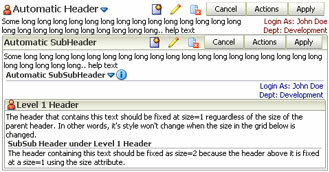 <af:richTextEditor> The richTextEditor component creates an input widget for rich text formatting. It also supports displaying a label, text, and messages. <af:selectBooleanCheckbox> A component which allows the end user to select a checkbox. <af:selectBooleanRadio> A component which allows the end user to select a radio button in a group of radio buttons. <af:selectItem> The selectItem tag represents a single item that the user may select from a list, choice, radio, or shuttle ADF control. <af:selectManyCheckbox> A component which allows the end user to select multiple valuesfrom a list of available options. <af:selectManyChoice> A menu-style component, which allows the user to select multiple values from a dropdown list of items. <af:selectManyListbox> The selectManyListbox component creates a component which allows the user to select multiple values from a list of items. <af:selectManyShuttle> The selectManyShuttle component provides a mechanism for selecting multiple values from a list of values by allowing the user to move items between two lists. <af:selectOneChoice> The selectOneChoice component creates a menu-style component, which allows the user to select a single value from a list of items. <af:selectOneListbox> The selectOneListbox component creates a component which allows the user to select a single value from a list of items. 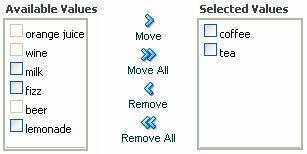 <af:selectOneRadio> A component which allows the end user to select a single value from a list of available options. <af:selectOrderShuttle> The selectOrderShuttle component provides a mechanism for selecting multiple values from a list of values by allowing the user to move items between two lists, and reordering that list of values. <af:separator> The seperator is used anywhere to create a horizontal separator between items. <af:showDetail> The showDetail provides a means of toggling a group of components between being hidden or shown. <af:showDetailHeader> The showDetailHeader provides a means of toggling the contents under a header between being disclosed(shown) or undisclosed(hidden). <af:showDetailItem> The showDetailItem represents a single item with specific contents that can be selected by users to be shown in a showOne component. <af:spacer> Used anywhere to add spacing between items. <af:statusIndicator> The statusIndicator displays an animated icon to indicate server activity. While a server request is active, the status icon is displayed, otherwise the idle icon is displayed. <af:table> The Table is used to display tabular data. It also supports selection (both single and multiple), sorting, and record navigation. <af:toolbar> A toolbar that usually contains buttons. <af:toolbox> A container for Toolbars and MenuBars, with built-in functionality like overflow. <af:train> The train component indicates the location of the current page within a multi-step process. Each step is represented as a train stop. <af:trainButtonBar> The trainButtonBar component is a collection of buttons that allows an additional means to navigate the stops in a train. This component can be used in conjunction with the train component to provide multiple ways to navigate through train stops. <af:tree> Represents an interactive tree component. <af:treeTable> Represents an interactive hierarchical table component. 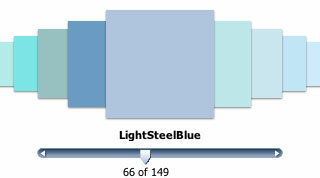 <af:convertColor> Converts an strings to and from java.awt.Color objects. The set of patterns used for conversion can be overriden. <af:convertDateTime> Converts string into java.util.Date and vice versa based on the pattern and style set. <af:convertNumber> This is an extension of the standard JSF javax.faces.convert.NumberConverter The converter provides all the standard functionality of the default NumberConverter and is strict while converting to object. <af:validateByteLength> Validates the byte length of strings when encoded. <af:validateDateRestriction> Validate that the date entered is within a given restriction. <af:validateDateTimeRange> Validate that the date entered is within a given range. <af:validateDoubleRange> Validate that the date entered is within a given range. <af:validateLength> Validate that the value entered is within a given length. <af:validateLongRange> Validate that the value entered is within a given range. <af:validateRegExp> Validate expression using java regular expression syntax. <af:clientListener> The clientListener tag is a declarative way to register a client-side listener script to be executed when a specific event type is fired. <af:fileDownloadActionListener> The fileDownloadActionListener tag is a declarative way to allow an action source (<commandButton>, <commandLink>, etc.) to programatically send the contents of a file to the user. <af:resetActionListener> The resetActionListener tag is a declarative way to allow an action source (<commandButton>, <commandLink>, etc.) to fire a reset action. <af:returnActionListener> The returnActionListener tag is a declarative way to allow an action source (<commandButton>, <commandLink>, etc.) to return a value from a dialog or process. <af:resetListener> The resetListener tag is a declarative way to reset input component values triggered from any server-side event. <af:serverListener> The serverListener tag is a declarative way to register a Java listener method to be executed when a custom client event is fired. <af:setActionListener> The setActionListener tag is a declarative way to allow an action source (<commandButton>, <commandLink>, etc.) to set a value before navigation. <af:setPropertyListener> The setPropertyListener tag is a declarative way to set a value in an event listener. <af:autoSuggestBehavior> The autoSuggestBehavior tag is a declarative way to show suggested items for the editable input components based on the user input. <af:checkUncommittedDataBehavior> The checkRegionUncommittedDataBehavior tag is a declarative way to show uncommitted data warning for command components with immediate="true"
<af:insertTextBehavior> The insertTextBehavior tag is a declarative way to insert text into an inputText at the current selection. <af:masonryLayoutBehavior> The masonryLayoutBehavior tag is a declarative way to allow an action source (<commandButton>, <commandLink>, etc.) to apply visual changes to a masonryLayout component. <af:panelDashboardBehavior> The panelDashboardBehavior tag is a declarative way to allow an action source (<commandButton>, <commandLink>, etc.) to apply visual changes to a panelDashboard component. <af:richTextEditorInsertBehavior> The richTextEditorInsertBehavior tag is a declarative way to insert an XHTML fragment into a richTextEditor at the current selection. <af:scrollComponentIntoViewBehavior> The scrollComponentIntoViewBehavior tag is a declarative way to scroll a component into view and optionally set focus in it. <af:showPopupBehavior> The showPopupBehavior tag is a declarative way to show a popup component in response to a client-side action event or other events (like right-click menus). <af:showPrintablePageBehavior> The showPrintablePageBehavior tag is the way to show a printable version of a page, by attaching the behavior to a command component. <af:attributeDragSource> The attributeDragSource tag is a declarative way of making a component a source of a drag using one of its attributes as the drag payload. <af:attributeDropTarget> The attributeDropTarget tag is a declarative of enabling the setting of a component's attribute by drag and drop. <af:calendarDropTarget> This tag makes calendar component a drop target and can be used to declaratively initialize the drop target. <af:collectionDragSource> This tag makes a collection component(for e.g. table, treeTable or tree) a drag source and can be used to declaratively initialize the drag source. <af:collectionDropTarget> This tag makes a collection component(for e.g. table, treeTable or tree) a drop target and can be used to declaratively initialize the drop target. <af:componentDragSource> The componentDragSource tag makes the enclosing component draggable. <af:dragSource> Makes a component specify a default drag source that this tag would automatically enable. <af:dropTarget> Makes a component eligible to accept drops during drag and drop. af:formatString Function for formatting a string with a positional parameter. af:formatString2 Function for formatting a string with two positional parameters. af:formatString3 Function for formatting a string with three positional parameters. af:formatString4 Function for formatting a string with four positional parameters. af:formatNamed Function for formatting a string with a named parameter. af:formatNamed2 Function for formatting a string with two named parameters. af:formatNamed3 Function for formatting a string with three named parameters. af:formatNamed4 Function for formatting a string with four named parameters. af:getCommonTimeZoneSelectItems Function for obtaining a list of SelectItems for commonly used timezones. af:getMergedTimeZoneSelectItems Function for obtaining a list of SelectItems for commonly used timezones, including the timezone passed in as a parameter. af:getCustomTimeZoneSelectItems Function for obtaining a list of SelectItems for a custom list of timezones, including the timezone passed in as an optional parameter. <af:clientAttribute> The clientAttribute tag specifies the name/value for an attribute which will both be made available both on the server-side (Faces) component as well on on the client-side equivalent. <af:componentDef> Defines a declarative component. <af:facetRef> Used in a page template or declarative component definition to reference a facet that was defined in the page template or declarative component usage. This tag can only be used inside of pageTemplateDef or componendDef. <af:forEach> The forEach tag is a replacement for the JSTL <forEach> tag that adds support for varStatus in JSF. <af:pageTemplateDef> Defines a page template. <af:skipLinkTarget> The skipLinkTarget tag makes it easy to provide end users with a way to skip over repetitive navigation content at the top of the page. <af:target> Provides a declarative way to allow a component to specify the list of targets it wants executed and rendered when an event (among the list of events) is fired by the component. 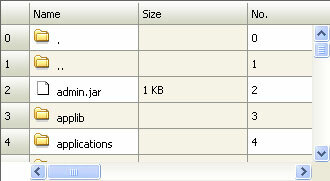 <af:xmlContent> Allows arbitrary xml content to be included in a jsp page. This tag should be used inside of a pageTemplateDef or a componentDef to describe the attributes, facets, and overall description of the page template or declarative component. 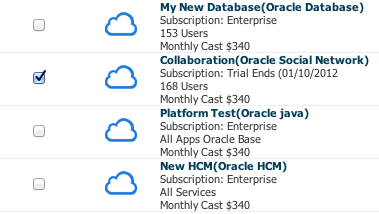 Copyright © 2016, Oracle. All rights reserved.